Today, our team at Voices for Civil Justice is excited to announce the official launch of All Rise for Civil Justice, a new national campaign for civil justice reform. Equal justice under law is a right, not a privilege. In America, we believe people should get fair resolutions to problems that threaten their families, homes and livelihoods. At some point, most people have a problem like a divorce or wrongful treatment by a landlord or debt collector and need a legal solution. But millions lose their cases in civil court each year, not because they’ve done something wrong, but because they don’t have the information or legal help they need. Too often, wealth and power have the advantage in civil courts, and the human toll is high. We have to fix our nation’s civil justice system so it works for everyone – and to do that, we need everyday Americans to better understand the problem and get talking about the heartbreaking (and often avoidable) chaos that so many people deal with each year. 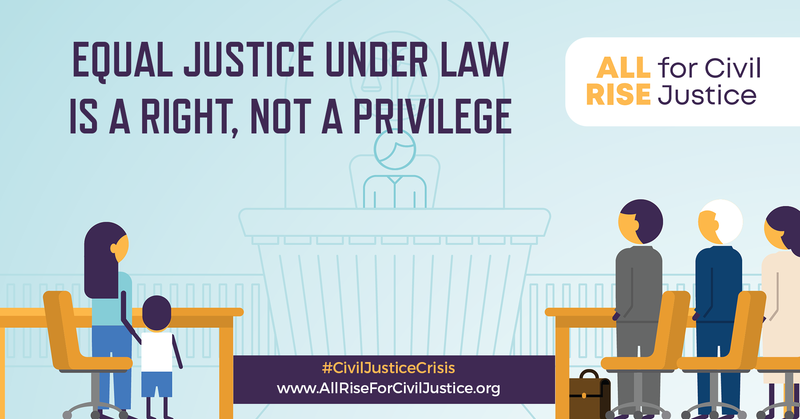 The All Rise for Civil Justice website centers the stories of people facing serious problems in need of legal solutions, the advocates working to help them, and the solutions available to make the civil justice system work for everyone. Will you take a few minutes to check out the site and follow All Rise for Civil Justice on social media? Visit the All Rise Website and explore the stories, solutions, and toolkit. Follow @AllRiseJustice on Twitter and join the discussion about this important effort. Become a fan on Facebook and amplify the stories we’ll share through All Rise. Follow @AllRiseJustice on Instagram and learn how photos can tell the stories of what happens when civil justice works the way it should. In the coming weeks and months, we’ll be sharing stories that illuminate the civil justice crisis, whether it’s a family facing eviction, a parent embroiled in a custody dispute, or a veteran who has been wrongly denied medical care. We’ll highlight tangible solutions that can help to address a crisis that’s leaving countless Americans homeless, bankrupt and vulnerable to harm through no fault of their own. And we’ll share resources to enable advocates like you to better tell stories of affected people and communities. The All Rise for Civil Justice campaign will fuel our ongoing efforts at Voices for Civil Justice to drive a steady drumbeat of media coverage and to build the national narrative around the civil justice crisis by putting your stories and the stories of people you advocate for at the center of the conversation. As always, we’re a phone call or email away to help tackle questions about big picture strategic thinking, communications strategies, or guidance on press releases and contacting reporters. Together, we’ll keep pushing forward to secure equal justice under law – for all Americans.